In connection with my talk today, Nov. 8, on Failed Evidence at the University of Minnesota Law School, I’ve been interviewed by Minnesota Public Radio. The interview is posted today as part of The Daily Circuit program. You can get to it here. Failed Evidence: Why Law Enforcement Resists Science will be the subject of two public forums this week, one in Washington, D.C., and the other in Baltimore. Both events are free and open to the public. On Wednesday, October 3, I’ll discuss the book at noon at American University’s Washington College of Law, 4801 Massachusetts Avenue N.W. (6th floor). My talk will be followed by a panel discussion featuring former Assistant U.S. Attorney Dan Zachem and Professor Paul Butler of Georgetown University. Full details are here. On Thursday, October 4, I’ll lead a discussion of the book at 5:30 p.m. at the University of Baltimore School of Law, 1401 Charles Street. The panel to follow will include Gregg Bernstein, the elected State’s Attorney for Baltimore. Full details are here. 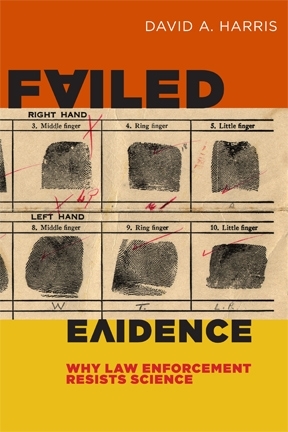 Today, September 20, at 5:30 p.m., I’ll discuss Failed Evidence: Why Law Enforcement Resists Science (NYU Press) at an author’s talk and panel discussion in New York City at John Jay College of Criminal Justice today, September 20, at 5:30 p.m. Full details are here. The talk is free and open to the public. The talk will be followed by a panel discussion by four members of John Jay’s faculty: Margaret Bull Kovera (Psychology), Nicholas D. K. Petraco (Forensics and statistics), Lawrence Kobilinsky (Forensics and DNA), and Eugene O’Donnell (Police Science and Criminal Justice Administration). The panel will be moderated by Zachary Carter, former U.S. Attorney for the Eastern District of New York.